Yuria of Londor is an NPC in Dark Souls 3. A very mysterious character that appears after you find Yoel of Londor dead. She is a member of the Darkwraiths, with the primary goal of bringing about the Age of Dark. She is or was a maiden of the primordial serpent, Darkstalker Kaathe. Yuria is one of three sisters which founded the Sable Church of Londor. The youngest sister's name is Liliane and the eldest's name is Elfriede. 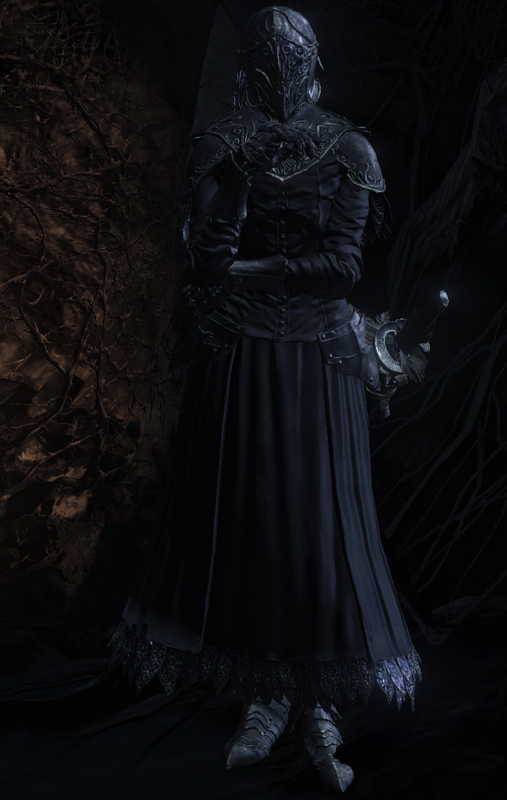 Yuria can be met in the main game and Elfriede is found in the Ashes of Ariandel DLC. Liliane makes her sole appearance alongside Yuria in the cutscene for the "Userpation of Fire" ending. Gives the Morion Blade, after giving her Orbeck's Ashes. If you kill Anri before triggering her arrival at firelink shrine she will not appear. Wears the Black Set and wields Darkdrift and a Dark Hand. Replaces Yoel of Londor when he dies after he levels you up 5 times via the Dark Sigil, You must complete that before entering the catacombs of carthus or his death will not trigger her arrival. If player cures the Dark Sigil before Yoel of Londor dies, she will not appear. After her apperance, If the player cures the Dark Sigil at any point, Yuria will abandon Firelink Shrine and her questline will stop for that playthrough. However, the player may use purging stones to reset hollowing to 0 without any negative consequence. Can be summoned for the Soul of Cinder fight if you followed her story for the alternative ending. This will also create a second summon sign to summon Pale Shade of Londor for the fight. She will not attack you if you attack her after performing the wedding ritual with Anri, and will say a unique line when killed. You can find Yuria of Londor at Firelink Shrine close by Yoel of Londor after completing his quest line. If you want to kill Yuria, beware of her fast movement speed, and lead her to the shrine main door, she will not be able to go through, and you can then easily kill her. Ranged doesn't seem to be effective to her, but at the same time she does alot of damage close range, so a spear, halberd, or melee weapons with range is recommended. Angering her will cause the Londor Pale Shade to invade in Farron Keep and Irithyll, dropping the Manikin Claws on the first encounter and the Pale Shade Set after both invasions. The invasions occur as long as you are kindled, and the bosses of those respective areas are not defeated. This will normally void the Ursurpation of Fire Ending. However, if the player hits Yuria three times to aggro her, then pays for Absolution after both invasions, they may have both the invasions and the ending. Absolution is done by visiting the Statue of Velka in the Undead Settlement, just before the Dilapidated Bridge bonfire. To reach it, the Grave Key, or a method of surviving the drop into the ravine where Eygon sits, is required. The key may be purchased from the Shrine Handmaid for 1500 souls after giving her the Mortician's Ashes. Allows the purchase of her Black armor set from the Shrine Handmaid after death, as well as the items Yuria sells. Start: Complete the quest line of Yoel of Londor to get Yuria to appear in Firelink Shrine and to begin her quest line. The player will need to meet with Anri of Astora in the Road of Sacrifices and will need to progress Anri's questline. You will need to keep Anri alive and so you must avoid mentioning Horace to Anri at all, or defeat Horace in Smouldering Lake. After meeting with Anri in the Catacombs of Carthus near the wooden bridge before High Lord Wolnir, meet Anri at the Church of Yorksha Bonfire in Irithyll of the Boreal Valley. In this room there is an assassin disguised as a statue tasked with killing Anri. You must exaust all of Anri's dialog and progress to the area's boss fight without killing the assassin. After defeating Pontiff Sulyvahn, talk to Yuria at Firelink Shrine. She will inform you that your spouse waits for you in the Temple of Darkmoon. To access the temple of Darkmoon, the player must break through an illusory wall behind a statue of Lord Gwyn at the bottom of the rotating lift in Anor Londo. Note: If you kill the assassin camouflaged as a statue in the corner of the Church of Yorshka Bonfire in Irithyll of the Boreal Valley Yuria will depart Firelink Shrine. Saving Anri of Astora from assasination is the equivalent of healing the Dark Sigil. Afterwards, talk to Yuria at the Firelink Shrine. She will congratulate you on your ceremony and will tell you that when the time is right to take the fire instead of linking it. At this point you may also return to the Tomb to find Anri's Straight Sword. End: You must now complete the game with all of the Dark Sigils you have obtained. After defeating the final boss, interact with the fire to start the cinematic (You can also return to her spot before the cutscene, you only need to have killed the final boss). If you summoned Yuria to help you fight the final boss WITHOUT letting Yuria die, and you have not chosen to continue into a new game, you may find Yuria's Darkdrift and Black Set where she was standing in Firelink Shrine. She will remain in Firelink post-game if she was not summoned for the battle. Should Yuria die during the final battle, she will be found standing in her original spot in firelink shrine. If you killed the final boss and walk back to Firelink Shrine without link the fire, you still can find Yuria's Darkdrift and Black Set where she was standing in Firelink Shrine. Start: Complete the questline of Yoel of Londor to get Yuria to appear in Firelink Shrine and to begin this optional quest. Yuria tasks the player to kill Orbeck as she fears he may challenge your position as lord of the hollowed. End: After killing Orbeck you must give the ashes to Yuria in order for Orbeck's death to register. She rewards the player with the Morion Blade and praises you. Note: You DO NOT have to kill Orbeck at all. This is done by simply progressing though Orbeck's questline to the very end at which you find his ashes in the Grand Archives after you summon him to help you in the fight against Lothric Younger Prince. ...Oh, prithee...art thou good Yoel's master? I am Yuria of Londor, a close friend of his. Thanks to thee, Yoel's soul is redeem'd. Allow me to express my gratitude, in his stead. Thou'rt a Lord, art thou not? Bearer of the dark sigil, and our Lord of Hollows. For the time thou remain'st our Lord, we of Londor shall serve thee. And I, of course, am also thine." Orbeck of Vinheim is a cause of much consternation. He proclaimeth himself Lord of Hollows. If left alone, he may one day imperil thy rule. Fall to this matter yarely, else we are unraveled. Decisiveness is the mark of a true monarch..."
Ahh, I see Orbeck's claim is proven false. As it should be, our right and deserving Lord of Hollows. It is a Londor treasure, befitting of a true Lord. Lord of Hollows, may the dark sigil guide thy way." Knowest thou of a youth/maid named Anri? He/She is hollow, and will join thee in wedlock. A fellow of mine guides him/her at this moment. When the time is ripe, thou mayst make thy salutations. For what Lord taketh no spouse?" Ahh, greetings, our Lord and Liege. Good tidings.Thy spouse is ready. The time is ripe to greet him/her. The boy/girl awaits thee, in the hidden darkmoon chamber of Anor Londo. So thou mayst a true monarch become." Ahh, our Lord and liege. I presume thy holy vows are sworn? Wonderful. Now thou'rt the true and deserving Lord of Hollows. With a spouse, the strength to claim the fire is thine. Thy Lordship, I prithee wrest the fire from its mantle. I, Yuria, and all of Londor, embrace thy impending Lordship." I prithee play the usurper. When the moment cometh to link the fire, wrest it from its mantle. The Age of Fire was founded by the old gods, sustained by the linking of the fire. But the old gods are no more, and the all-powerful fire deserveth a new heir. Our Lord of Hollows, it shall be, who weareth the true face of mankind." After placing the Cinders of the Lords? Thine heart is fix'd upon the linking of the fire. But brave usurper, I prithee, wrest the flame from its mantle. So that we Hollows, in most honest shape of man, may have it for our own." "Away to link the fire, I presume? Think not on thy fears. The dark sigil will guide thee. Link the fire, our Lord of Hollows." You have healed the Lord's Sign, there is nothing to converse about..."
Thou'st forsworn the Lord's Mark. There is naught more to say. Farewell, our fleeting Lord." Hmph, Yoel knows not of thy folly. A Hollow need not be mad. No one so weak shall ever rule us!" Peasant, at least thy cadaver shall a little kindling make...."
Kaathe, I have failed thee..."
Twas the soul of my sister. She is voiced by Pooky Quesnel, who previously voiced Arianna, Woman of Pleasure in Bloodborne. Her NPC killing sidequest is similar to Mephistopheles in Demon's Souls. Facinatingly, in the original Japanese, Yuria's dying line regarding Kaathe makes direct reference to having failed Kaathe's dying wish, implying that he is no longer alive. If following Yoel/Yuria's questline, Yuria will inform the player that Anri is Hollow and one of her friends is guiding him/her. At this time if Anri is talked to he/she will mention that a Pilgrim told him/her of the path to the Boreal Valley. The pilgrim he/she mentions is likely the friend Yuria mentions, although some speculate that it could be Anri's guardian Horace The Hushed. She is in part a reference to Yuria, the Witch from Demon's Souls, as both teach the player magics and both are considered "dark" characters (Yuria, the Witch being a witch, and Yuria of Londor being a hollow). Curiously, the witch Karla directly resembles the Yuria of Demon's Souls, posessing the same hair, hat, and general attire, the same belief of herself as a vile thing and directly teaching the player dark spells and miracles. Why this dividing up of the name and role exists is unknown. Interestingly enough, despite being a hollow, Yuria does not have the appearance of a hollow under her black dress and mask. One can see images of Yuria without her mask, and she appears as a normal unhollowed female (lacks hair due to developers not needing to add hair as she never removes the mask in game). It is possible that these are simply the developers choosing not to add this detail due to her never removing the mask. However, other hollow characters such as Horace and Anri are hollow under their clothing. Therefore it is fully possible this is intentional, as wearing the black dress unhollowed still shows its "hollow" appearance, meaning the dress doesn't necessarily look that way because of Yuria being hollow underneath, rather the dress is tailored to look like that. She could be using an Untrue Dark Ring or Purging Stones, both of which she sells. Once the player becomes the Lord of Hollows, they will be able to attack Yuria without her fighting back. I am stuck and cant marry anri. Yuria says to marry her, but the pilgrim dude isnt waiting for me. The tomb is empty. Is it because i killed horris and Wolnir before telling her i havent found him? Well i went back to her spots. There is a prism stone at the catacombs. I talked to her at the bridge and the church. I did recieve tge ring from anri. Did i mess up the steps? If you wonder why all the npc invaders have 4 estus it&apos;s because yuria stole all of there estus. Does Yuria take extra damage from the hollowslayer greatsword? >Replaces Yoel of Londor when he dies after he levels you up 5 times via the Dark Sigil, You must complete that before entering the catacombs of carthus or his death will not trigger her arrival. Not sucking hard enough *****s you over, I see. Are you on the Lord of Hollows ending but don&apos;t want to summon her & keep her alive for the last boss fight to get Yuria&apos;s armor and weapon? Just kill the last boss, immediately go back to Firelink Shrine, and kill Yuria to get her stuff; you&apos;ll remain on the Hollow ending. She&apos;ll drop her weapon and ashes which you can give to the handmaiden so you can buy the armor. Of course, just be sure to do every sidequest or whatever with Yuria beforehand (like the one involving Orbeck) before killing her. I don&apos;t believe any of those conspiracies about her, such as "transferring all curses on me". All I see is that she needs someone capable of claiming the remaining flame&apos;s power to make Londor great again, and she is willing to serve that person to this end, together with her sister Liliane. She even leaves her clothes behind as proof after soul of cinder is taken care of. btw she makes that fight so much easier too, great teamwork. It&apos;s a win-win situation for all of us, so obviously. She is very easy to kill with the Dark Hand. Just use fully charged punches (while allowing stamina to recharge between them) and after the third one R1 R1 R1 R1 R1 until she is dead. She will be quite helpless. If you&apos;ve spoken with Friede before becoming Lord of Hollows, Yuria will have new dialogue and mention a familiar scent on you, like blossoms, then warns you about letting kindness into your heart. Ummmmmmm so I did the ending (and I know I did it right I got the trophy and everything) but she didn&apos;t die. So I can&apos;t get her stuff without killing her, and I really don&apos;t want to kill her. Also I didn&apos;t go into ng++ after doing it. She can climb the unkicked ladder in firelink shrine. Unbelievable. When I came to talk to her about Orbeck&apos;s death , she spoke about a weird scent and kind actions when I interacted with her before her menu appeared , I can&apos;t see these dialogs in the quotes on this page , does anyone know why it appeared? All the salt people are pourin&apos; over the one true waifu. I pity their wretched souls. She will give you s little bow if you use any bowing gesture. I accidentally killed the Pilgrim in the Church of Yorshka, is there any way (Cheat Engine or otherwise) to make the Usurpation of Fire ending possible again? I got all the sigils with yoel so yuria would appear and i could buy her rings and purging stones. But when i went out to progress the game to get souls i killed anri n horace to get the elite knight set (its one of my favourite sets in the series). Then when i had killed the sage to get souls i returned to the shrine to buy the rings, but now she dissapeared. Im guessing anri is connected to yurias questline because she tries assassinating her later. If only i knew that. At least i had enough souls to buy one of them before she vanished, but my plan was to get the untru white ring to troll new players as a mound maker. can you give yuria scrolls for sorceries ?? can&apos;t kill orbeck if nobody is giving me power ! "You DO NOT have to kill Orbeck at all. This is done by simply progressing though Orbeck&apos;s questline to the very end at which you find his ashes in the Grand Archives after you summon him to help you in the fight against Lothric Younger Prince." You don&apos;t need to summon him for that fight at all, just complete his quest line and buy all of his stuff.